A section on The Cat Toys, where we are told “I do not wish to play with my cat toys” is followed by The Things That Are Not, Strictly Speaking, Cat Toys, But Which Nevertheless Have Great Play Value – a vase, a lamp, or a crystal candy dish. “Alas, they are not very durable” is translated as “C’est la vie”. The Enemies of course include the dog, the mean child and the lawn mower, and we might hear “Je voudrais que la tondeuse du gazon ecrase le chat du voisin” (“I wish that the lawn mower would run over the neighbor’s cat”). It’s a tiny book with a hard cover and just a small amount of text on each of its ninety pages, rather like a children’s book. There are charming watercolour sketches on every page, almost half in colour, the rest in black and white, from a double page aerial view of the territory and neighbouring cats’ gardens to a tiny bell and a name tag. Henry Beard is said to be ‘a firm believer in the pesky but potentially highly profitable secondary school foreign language requirement’. Well, this is an American book, but I have to admit that the expressions given here don’t relate particularly closely to our GCSE French syllabus. Nevertheless, they might provide a but of fun to a bored pupil, and the simplicity of the layout with so many illustrations might even appeal to a younger child and spark an interest in French. Other than that, it’s for cat sitters in France, or of course for any cat-lover emigrating to France who will find some useful phrases here to use in the pet shop or at the vet. 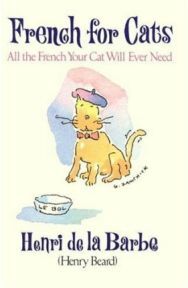 It could be a good stocking-filler for any cat-owner who has an interest in French. One Comment on "French for Cats"
This reminds me of the time our friend’s bilingual 2-year old tried to teach our cat French.